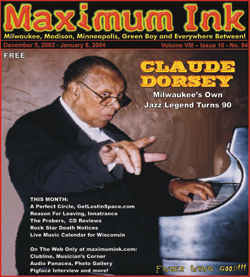 Milwaukee's Claude Dorsey makes the cover at 93 years old, the oldest yet! Dorsey traces his roots to Gainesville, Georgia, about 40 miles north of Atlanta. “My daddy was the main minister of a church there,” he said. “I wanted to follow him – I tried, but I was always playing music.” Dorsey came to Milwaukee as a teen in 1928. “My dad became minister at Calvary Baptist Church,” he said. The approval of his father was an important factor in Dorsey’s career. “When he heard me play, he said, ‘you’re ministering here; you’re reaching people. That’s what it’s all about.’ I was so happy that my daddy approved of what I was doing; that he was proud of me,” he said. In developing his style, Dorsey assimilated elements from many of the popular pianists and bandleaders of the 1930s and ‘40s. “I liked the boogie and the blues,” Dorsey said. “Ellington, Basie, Fats Waller, Art Tatum, Nat ‘King’ Cole ; they all were an influence, as was Cab Calloway’s band.” One of Dorsey’s early groups was Bert Bailey & His Brown Buddies. “We did a lot of shows for soldiers,” Dorsey said. At the peak of his career, Dorsey and his band performed across the Midwest, and even made one trip to California. Although details have faded from his memory, Dorsey also has fond recollections of backing Billie Holiday. “I played several dates for her,” he said. “She was the lady. And a nice person, too.” Later, Dorsey worked with Count Basie’s long-time vocalist, Joe Williams. “When he would visit Chicago late in his career, he would come up and sit in with me ,” Dorsey said. The Clock became the focal point for several investigations on Mafia activity in the late 1970s and early 1980s. But Dorsey said the FBI never asked him if he witnessed anything unusual. “What they did was their business,” he said of reputed mob leaders. “It didn’t involve me. I was raised differently.” Dorsey did recall their musical preferences, though. “They liked Ellington, and they also liked the religious songs,” he said. While Dorsey has made a career from performing standards, he’s learned much about how best to perform them. “A good standard is one that people ask for a lot,” he said. “If I didn’t know it, I would get the record and listen to it to get some ideas.” In adapting standards, Dorsey incorporates several techniques to set his arrangements off. “I’ll change the tempo or change the key; it keeps the peoples’ attention,” he said. “I’ll also throw in occasional classical tunes – Chopin and those other ‘Good Guys,’ he said. At this point, Claude’s wife of 20 years, Mary , jumped in. “Claude knew (CD Producer) Barbara (Wagner )‘s dad for many years. When Claude had a mild stroke, Barbara put everything together while he was recovering – lining up the investors, the studio, and the musicians. After Claude got over a case of bronchitis – six weeks after he came home from the hospital – Claude was making his first recordings,” she said. Peppered with standards, “What A Wonderful World” includes one of Dorsey’s own compositions, “Summer Is Over,” which dates to 1946. “I had the time to recompose it, to change some of the lyrics around, the whole bit,” he said. Joining him on the recording are Gary Christensen on bass and Scott Van Domelen on soprano saxophone. “Scott is young, but he can really play. It makes me feel good,” Dorsey said. He also noted that loyal fans still catch him in his monthly gigs at Caroline ‘s, a venerable jazz club in Walker’s Point. “I’ve known some of the people for more than 50 years, and they say, ‘you still got it.’ It feels good to know that I’m still reaching people,” he said.